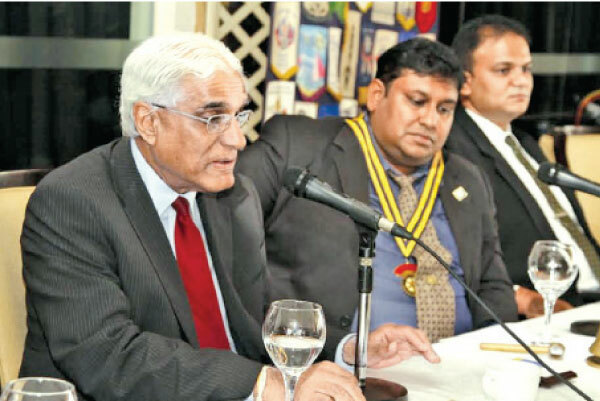 Dr. Indrajit Coomaraswamy, Governor of the Central Bank outlined the Government's policies which he stressed should be pro-active and not merely for short term political expedience at the Rotary Club of Colombo West meeting held recently in Colombo chaired by Rotary Club President Roshan Perera. He drew the attention of the audience to the continuing worrying situation of the twin deficits; the budget deficit and deficit on trade. He reiterated that economic reforms were necessary, but should be consistent and steered with commitment and a clear goal of the envisioned outcome. He also spelt out proposed plans for economic recovery through the twin pillars for economic transformation, namely Foreign Direct Investments (FDI's) and exports. Several fellow Rotary members participated at the meeting Where the head table also comprised of Senake Amarasinghe, Governor District 3220 and Harsha Rajan - Secretary Rotary Club of Colombo West. It was the fifth meeting for 2017. The agenda was focused on building cordial relations and goodwill among Rotarians comprising of business and professional leaders with a view in providing humanitarian services to the community at large. The speech was followed by a Q & A session enabling members to air their concerns and clarify doubts regarding the proposed roadmap for economic progress.